UKHO Chief Executive, Ian Moncrieff CBE with William Heaps at the award ceremony in Southampton. William Heaps, Assistant Marine Advisor and Hydrographic Manager of the U.K.’s leading port group, Associated British Ports (ABP) has been presented with the United Kingdom Hydrographic Office’s (UKHO’s) Alexander Dalrymple Award at a ceremony in Southampton. This prestigious award is dedicated to Alexander Dalrymple who formed the hydrographic office in 1795 and is a symbol of recognition for outstanding dedication and contribution to world hydrography. William was honored with the award for his contribution to hydrography over his career with ABP as Port Surveyor and Hydrographic Manager of the 22 ports and harbors within the ABP Group. As a specialist in Port Marine Safety, William provides guidance to Harbor Masters within the group. The award also acknowledges many areas of William’s work as past Chairman of the Hydrographic Society UK (THS UK), which he chaired for six years, and as U.K. representative and Chairman of the International Federation of Hydrographic Societies (IFHS). William’s devotion to making these organizations effective and inclusive includes his contributions to numerous seminars and conferences within the hydrographic community. The award was presented by UKHO Chief Executive, Ian Moncrieff CBE who commented, “My Executive team were unanimous in nominating William for the award, which has been won by a number of distinguished international hydrographers in the past. “William is hugely respected and recognized in the maritime navigational safety sector and port management sector. He has selflessly devoted much of his time outside of core work towards raising awareness and importance of hydrography to wider audiences, as well as furthering continual professional development for those working in this sector. 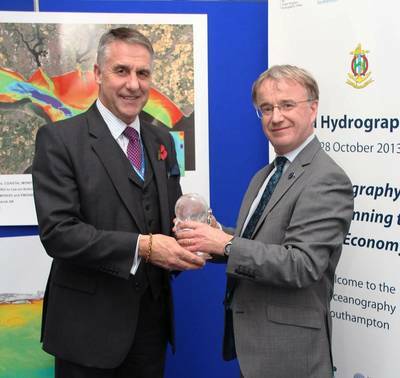 The ceremony took place at the U.K.’s celebration of World Hydrography Day at a joint event between UHKO, ABP Southampton, The Maritime and Coastguard Agency (MCA) and Southampton’s National Oceanography Centre (NOC) held at the NOC. During the event, four co-hosts explored the theme of the “Blue Economy” focusing on its value to the U.K.’s economy and coastal states across the globe.